Those familiar with the social photo site Instagram know that a quick scroll through its pages generally reveals several things: selfies, dreamy pictures of landscapes, filtered photos of cups of coffee, and delicately edited images of food. Those carefully styled food photos were the inspiration behind one of the Davis Museum’s featured exhibits this fall. “I’m... one of those people who can’t eat anything until I’ve taken a picture and I’ve put it up on Instagram,” Liz Gardner, public programs specialist, confessed with a laugh to WBUR’s Andrea Shea. Gardner was one of the Davis curators who indulged the pop-cultural tendency, scrolling through the Davis Museum’s nearly 11,000-piece collection to create Feast Your Eyes. The collection will be featured on-air Wednesday in a story by Boston NPR affiliate WBUR and is also the subject of an article this week on WBUR’s blog The Artery. The 33 works comprising Feast Your Eyes include photographs by such artists as Edward Weston and Walker Evans, as well as paintings like Alonzo De Escobar’s Still Life With Side of Beef. The exhibit also encompasses work from a variety of both geographic and cultural locations, all falling under the umbrella of still life versions of food. Local chef Dave Becker of Juniper in Wellesley and Sweet Basil in Needham brought literal flavor to this celebration of food’s grand opening in October by bringing along his own recipes to share with visitors. The opening, an event titled Food for Thought, was designed by Davis Museum intern Hannah Levine ’15, and featured inspired hors d’oeuvres based on a selected works (one of Becker’s recipes, inspired by De Escobar’s painting, accompanies the WBUR Artery story). Feast Your Eyes runs through December 21, 2014. —Katelyn Campbell ’17 contributed to this report. 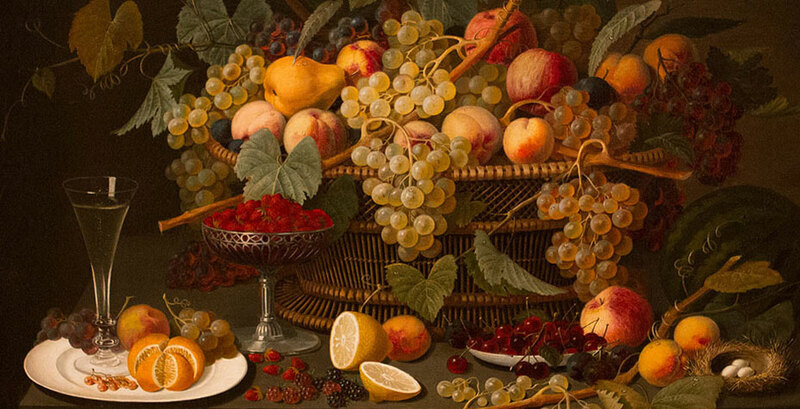 Image: "Still Life with Fruit", Roesen, Severin (attributed to) (German), 1850-60, Oil on canvas mounted on panel, canvas: 30 1/2 in. x 40 1/2 in. (77.5 cm x 102.9 cm), Gift of Mr. and Mrs. Eliot Stetson Knowles.